Moot IF Hostage Pope Gregory XVII "Siri' Said "New Mass"
Some uncatechized and/or willfully ignorant people, have tried to say that Pope Gregory XVII (1958-1989), who was under grave duress for 30 years by the freemasons, "lost his papacy" for possibly offering the reprobate "New Order Mass". The Roman Breviary reads on April 5th: "During the cruel persecution of the Emperor Diocletian. 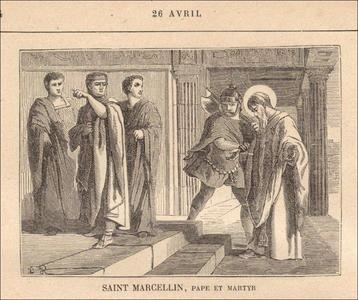 Marcellinus of Rome, overcome with terror, offered incense to the idols of the gods. For this sin he did penance and wearing a hair-shirt went to the Council of Sinuesso, where many Bishops had assembled and there openly confessed his crime." *St. Thomas Aquinas teaches in order to constitute a genuine [true] act of the will: the act must be performed spontaneously [freely] -without constraint or force- (and that) man can be coerced or forced to do something against his will in two ways: by violence and by fear (VI. 4, 5,6). That which is done under exterior violence is wholly involuntary (VI. 5). "Pope Marcellinus ruled the Church of Rome for nine years and four months. By order of Emperors Diocletian and Maximian he was taken prisoner and brought forward to offer sacrifice to the idols. At first he refused and was threatened with various kinds of torture, and for fear of the threatened suffering he put down two grains of incense in sacrifice to the gods. This gave great joy to the infidels but caused the faithful immense sadness. The Pope, repentant, lamented his fault and *deposed himself, but the whole gathering immediately re-elected him. When the Emperors heard of this, they had him arrested again. He absolutely refused to offer sacrifice to the idols, so they sentenced him to be beheaded. Then the persecution was renewed with such a fury that in one month 17,000 Christians were put to death. *Note: Pope Marcellinus did not ipso facto lose his office as pope. He weighed his own specific case in his own mind, and then judged to depose himself (but was "immediately re-elected"). TCW learned in 2006, that Pope Gregory XVII ("Siri") in discussing with trusted clergy, in the Spring of 1988, concerning his own lethal "duress situation", concurred with them, that as he was not a free moral agent to act (due to his being a captive of the freemasons), it removed culpability for his seeming transgressions against the Faith (such as attending the apostate V2 Council, or presiding in public gatherings "staged" by the antipopes). Thank you for this important information on His Holiness Pope Gregory XVII. Blessed be St Peter, Prince of the Apostles! The Bishops of St. Marcellinus in the council added, that Peter, too, sinned through the same weakness, & by the like tears, obtained pardon from God.